As we alteady discussed How to hide a full partition and to Lock a folder in pc without software, Which giving so much fun and making your friends so wondered or protecting your data out of reach from others.Now there is another trick for creating an invisible folder i.e no name and no icon. To create such type of folder then you have first to create a folder without name. To create folder without name follow these easy steps. Step-! 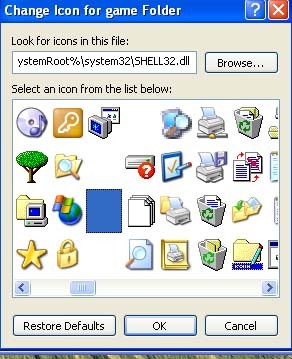 :Create a new folder(right click and new folder). Step-2: Rename the folder delete the previous name now hold at alt and type "0160" without quotos (note that type these numbers from keypad numbers and make sure your num lock is on if not then it will not work). Step-3: Your folder without name is created. Now to make it invisible:- Right click and goto properties>Then click on customize tab and click below change icon. Select an empty icon from the list of available icons. as given below. Now your folder is invisible....Make your friends surprise using these tricks and tips and keep visiting this site for more interesting computer tricks. please share this on facebook with your friends and give us your support. we will try to give your more and more impressive tricks.